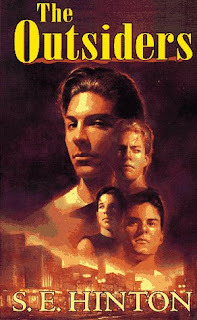 As I sit observing my youngest son as he begins to read the classic middle school read,The Outsiders, a bit of amusement crosses my face, for the irony does not escape me that I am watching my children grow up as they read a book about growing up and the loss of innocence, and likewise, my shadow in life grows just a bit longer with each passing day. The book is frequently on the must read list for the adolescent student as it deals with that awkward period in one's life when youth has not been totally surrendered and maturity sits on the horizon but is not yet attained. While the characters Ponyboy and Johnny are on the lam after a stabbing during a gang fight, they spend time reading in their hideout, which just so happens to be, not coincidentally I think, a church. They read from Gone With the Wind and Robert Frost's poem Nothing Gold Can Stay. Inevitably the students will be called upon to proffer an explanation as to why the author chose to introduce this particular poem into her novel, and the themes of youth, loss of innocence, and impermanence will be explored. 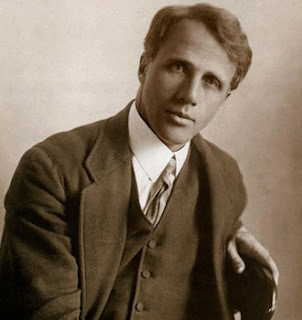 Only the inimitable poet Robert Frost could make the traverse from the advent of spring to the Fall of Man in 8 simple, yet perfect lines of poetry. I especially love how Frost utilizes alliteration in this poem. The second line - Her hardest hue to hold is nicely balanced against the seventh line - So dawn goes down to day creating a stylistic symmetry. I suppose he could have substituted the word dives for goes to further the point, but what do I know? There is something in this poem which is somewhat somber, but not in a necessarily sinister sense. Youth doesn't last forever, and it is a necessary fact that one grows up to the realities of life. Even the calamitous Fall of Man was in a sense an inevitable result of the taking from the tree of knowledge. Right and wrong and the attendant choices fasten the yokes upon us. But there is a bright side in that we have free choice and though change itself is as inexorable as the marching of time, we may choose a betterment. Let us pick up the pieces after the Fall, because although nothing gold can stay, we may still make choices of gold. I like the addition of spruce tips here which produces a smoother evergreen flavor than the juniper alone. The addition of kumquat is a different play on the citrus component and what would a Massachusetts Gin be if there wasn't a cranberry or two added in. For myself, I prefer a Gin that is proofed at 90%, but goes down smooth with little burn which is exactly what GrandTen delivers. 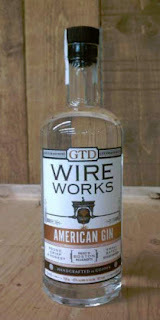 Overall, Wire Works Gin is one of the finest of the new age American Gins in terms of flavor and drinkability. It works well straight up, in a mixed drink, or my favorite of all beverages- The Martini.